Recently acquired from a local clearance, this lovely set of deep rich red mahogany William IV dining chairs are in reasonable condition for their age. The chairs feature a large swept back rail, over stuffed upholstered seats and hexagonal front legs. The chairs are all in fair condition, but some of the chairs have been repaired during their lifetime. We have pointed this repair work out in the photographs provided. 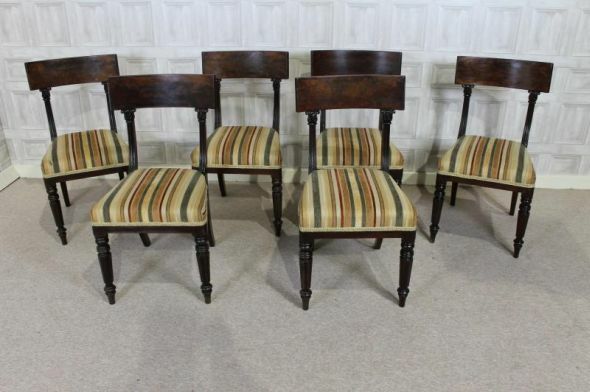 They are all extremely sturdy, and are a good, heavy dining room chair for any period property. Please note that the table pictured is not included in this listing, but can be purchased separately.